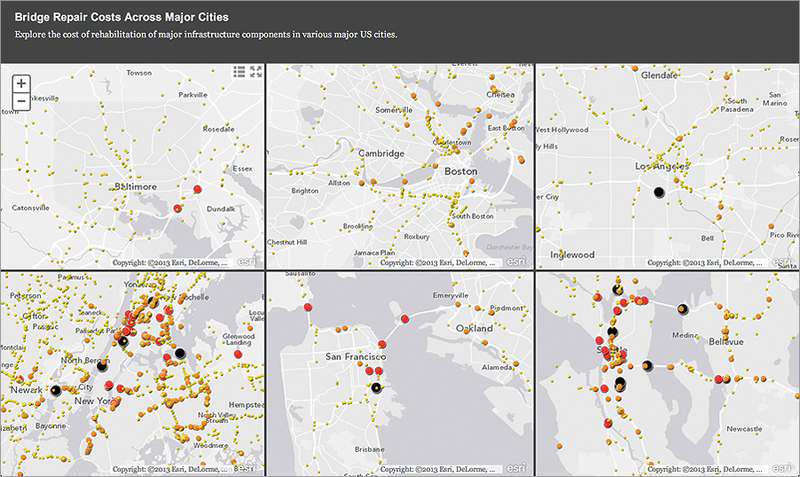 Showing which bridges are most traveled in and around Baltimore, Maryland, from Esri's Bridge Infrastructure Maps app, the newest version of the bridge app described by Governor O'Malley in this article. 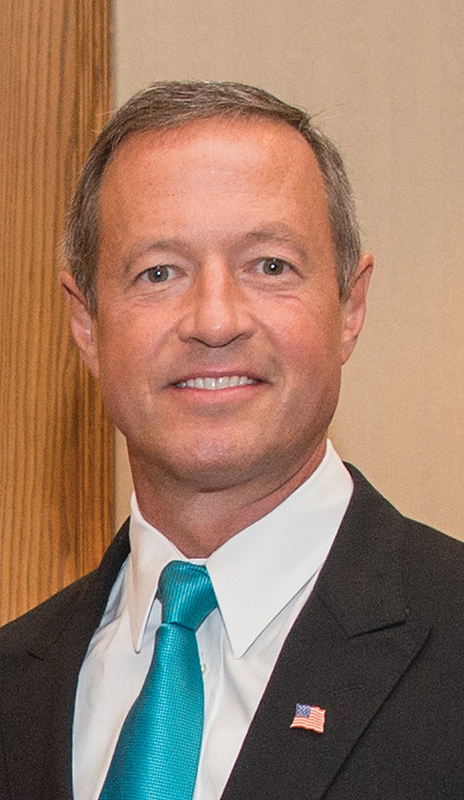 In October, Maryland Governor Martin O’Malley addressed the Network of Schools of Public Policy, Affairs and Administration (NASPAA) Annual Conference in Washington, DC. He emphasized governments’ need to measure performance. In this abbreviated version, he explains how GIS supports it. There are a lot of things that are right about our country. But we also have to acknowledge that middle-class American families are earning no more now than they were in 1989. How do we fix this? We must restore the balance of investments necessary for middle-class opportunity. And connected to this mission is the responsibility to modernize our government to make it more efficient in cost and more effective at delivering results. Over these last several and very difficult years in Maryland, we have chosen to move forward, not back. We have recovered 100 percent of the jobs we lost in the recession; reduced crime to 30-year lows; and last year, the health of the Chesapeake Bay actually improved a little bit rather than being degraded. The US Chamber of Commerce named us the number-one state for innovation and entrepreneurship. And we have the number-one median income in the country. If we want better results for ourselves and for our children, we must make better choices—choices that restore the balance of investments necessary for progress, choices that recover our shared sense of national purpose, choices that modernize and reform the way we govern ourselves. There is emerging in our country right now a new way of leadership. We see it rising from the ground up and from the next generation forward. We baby boomers, and our parents and grandparents, grew up with a way of leadership that was ideological, hierarchical, and bureaucratic. This next generation demands a different way of leadership. This new way of leadership is fundamentally entrepreneurial, operationally collaborative, and relentlessly performance measured. It is no longer about the tall triangle of command and control. It is about the circle on its side—an intelligent circle—in the center of other concentric circles. Circles of effective collaboration. When I was elected mayor of Baltimore in 1999, we had allowed ourselves to become the most addicted and violent city in America. But we saw what our neighbors in New York were doing—they were reducing crime with the CompStat system. Timely, accurate information shared by all; rapid deployment of resources; effective tactics and strategies; relentless follow-up. We borrowed this new approach to policing in Baltimore. And we went on to achieve the biggest reductions in Part 1 crime of any major city in America from 2000 to 2009. We also took this new system of performance measurement enterprise-wide. We called this innovation CitiStat. 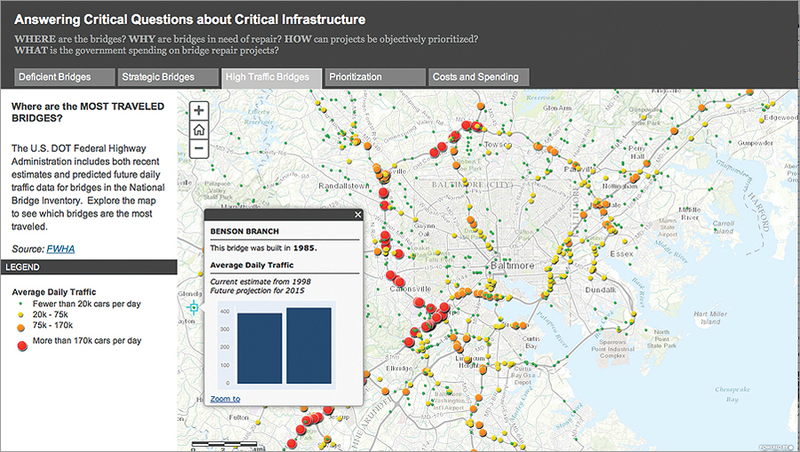 With the new Esri Bridge Infrastructure Maps app, users can easily compare bridge repair costs in several cities at once. We made it the new way of driving every department and agency. It is what cities all across America are now implementing in some way, shape, or form. This new way of leadership in public management is fundamentally changing the way we govern our cities, fundamentally changing the way we advance the common good. We used the Internet to make the information of progress making open and available to every citizen. We moved from “some time” management to real-time management—real time, real fast, real open, real transparent, and real accountable. We moved from a spoils-based system of patronage politics to a results-based system of performance politics. We moved from siloed bureaucracies to common platforms. Geographic information systems—GIS—allowed us to not only “put the cops on the dots”; smart maps also allowed us to run plays instead of just sending people out to scramble. Traditionally, the essential endeavors of any government—whether it’s state, federal, or local—were departmentalized into silos. One could spend a lifetime paying technology people a lot of money to try to connect up and down those separate silos of individual human effort, and still it would not happen. But in better-managed, modern governments, the informational bases of each of those silos now land on the same GIS map. Collaborative synergies start to take shape. Independent actions become part of a larger collaborative undertaking, part of a better synchronized dynamic of progress. He knew that Governor Rendell had a passion for infrastructure and the proper funding of our transportation needs like bridge repairs. Jack wanted to show Governor Rendell a new bridge app. 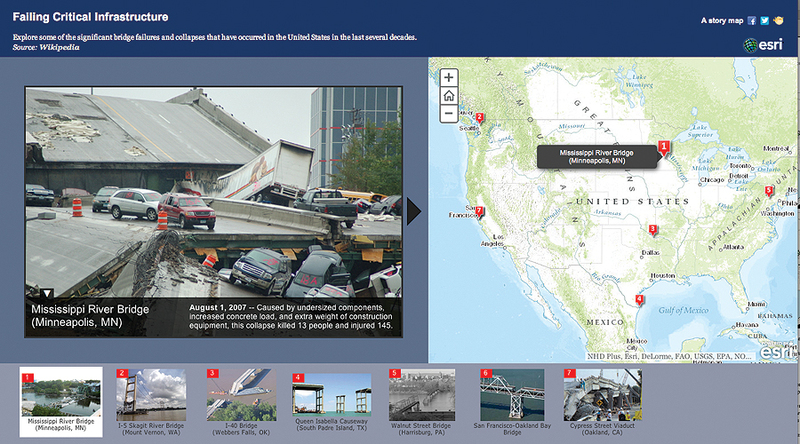 Details of the 2007 Mississippi River Bridge collapse in Minneapolis, Minnesota, are presented in the new Bridge Infrastructure Maps app, along with examples of other bridge collapses. Here’s a red, orange, yellow color code showing the same bridges, ranging from most structurally sound to most structurally deficient. And with that, he clicked the final key . . . and the dollars fell all over the place. Our job is to make sure we land the resources on the targets. That’s what CompStat was about. This is what CitiStat and StateStat are about. It’s what we are now doing in the State of Maryland with BayStat, with VetStat, and with JobStat. And it is a fundamentally different, smarter, and better way of governing for results. We have also started to see this movement head into the federal realm. The way every state, with our federal government, deployed the Recovery and Reinvestment Act dollars and tracked them openly online so every citizen could see whether the dollars were landing on the targets. 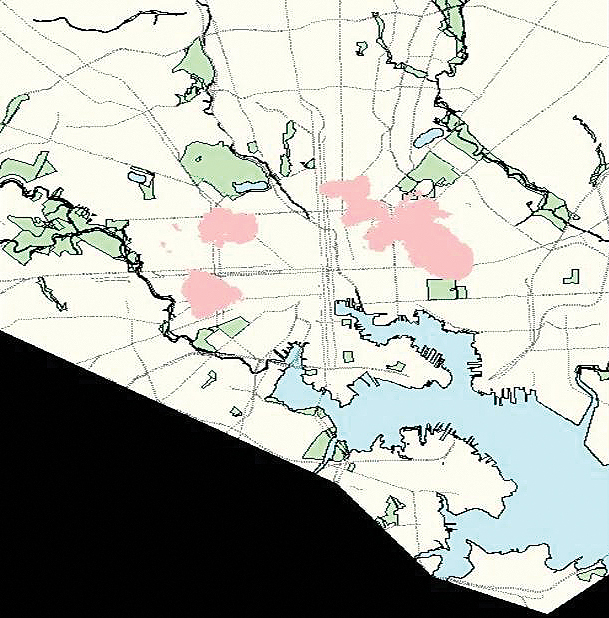 Through the EPA [Environmental Protection Agency], President Obama created something called ChesapeakeStat, where the EPA tracks our efforts to reduce the nitrogen, phosphorous, and sedimentary flow into the bay. 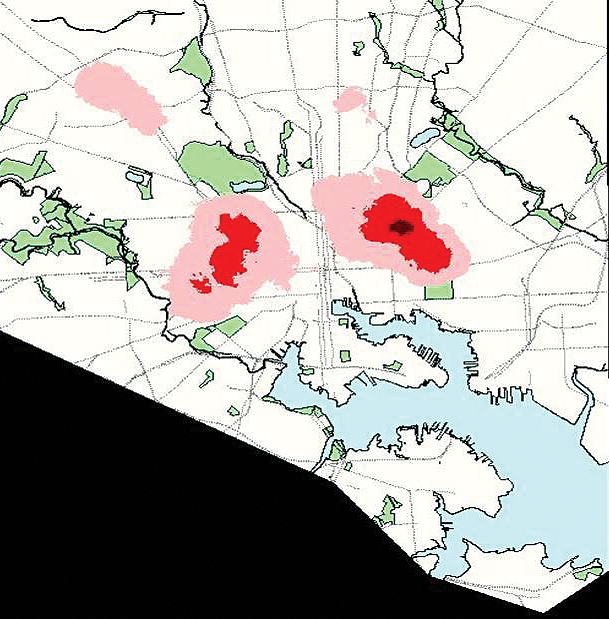 CitiStat maps highlighting shootings and homicides in Baltimore in 1999 (top) and 2005. Tinting denotes intensity. Other new federal evolutions include HUDStat, FEMAStat, and NASAStat. Understanding and harnessing the powerful connections in these human chains of delivery require the building of common platforms for progress. CitiStat is a common platform. Our energy grid is a common platform. Technology has arrived at a point where these common platforms not only facilitate relentless collaborations, but they also allow for crowd-based solutions on a massive scale. Crowd-based solutions that rise up from the power of individual actions—better informed, better connected, and more deeply aware. The challenge of our times is enormous. To create jobs and expand middle-class opportunity at a time when human population growth now depletes world resources faster than our planet can regenerate them. To make the needed change from a global economy of depletion to more localized economies of regeneration. We can only solve the challenges we face if we better understand the connections that we share. As our challenge is great, so, too, is our capacity, our technology, and our potential for greater compassion and deeper understanding. Mindful, individual action is the key. Action based on awareness; compelled by intention; motivated by a deep preference for a better future; and empowered by a modern, collaborative, performance-driven government. I’m not dreaming of some utopia here. I’m talking about more effective public administration. I’m talking about the difficult and urgently important work of a second American revolution. Visit Maryland’s Open Data Portal to learn more about StateStat.